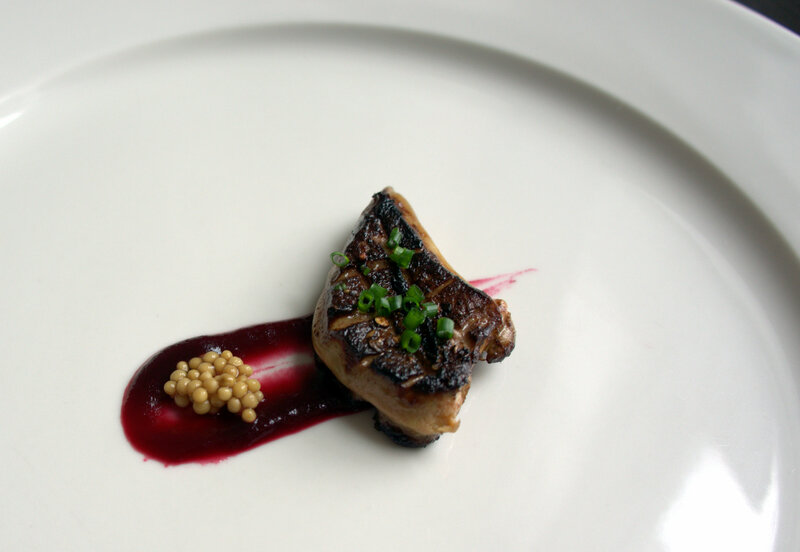 Foie gras is a controversial ingredient. Humanely raised or not, there is nothing pleasant being over fed (ever over ate and could not sleep? hopefully unlike humans, ducks can still sleep). We try to acquit ourselves of the guilt by this label called “Certified Humane”. That being said, this delicacy is simply irresistible- rich, creamy and silky. Let us just call it sinful pleasures! There are 2 typical preparations- pan seared and cold cured. For my first attempt, I decided to try the hot preparation of pan searing. To balance the richness, it was paired with accompaniments with high acid levels- hibiscus puree with lemon juice and pickled mustard seeds. grade A hudson valley foie gras, cut into 1 inch thick slabs. Tips: soak the knife in hot water before slicing help prevent breaking it. Prepare the mustard seed: combine all ingredients in tightly sealed glass jar, once cooled to room temperature, store in the fridge overnight, this will last a few weeks. Make the hibiscus puree: boil the dried flowers with the water and ginger for 30min to rehydrate, puree until smooth, add lemon juice and blend it in. Sear the foie gras: get a heavy pan smoking hot, season generously with salt and pepper, sear one min per side. Done. Plate the 3 component whatever way feels right. Warning: it gets super smoky during the searing, make sure good ventilation is in place. Dana, I don’t think you were home, but it got so smoky, the fire alarm was triggered twice! After the first time, I opened the window and put the fan up, but it still triggered the alarm. I was probably out but was it you that had the fire department empty out our building? I just home from shopping and everybody was outside.